Still from the promotional ad. 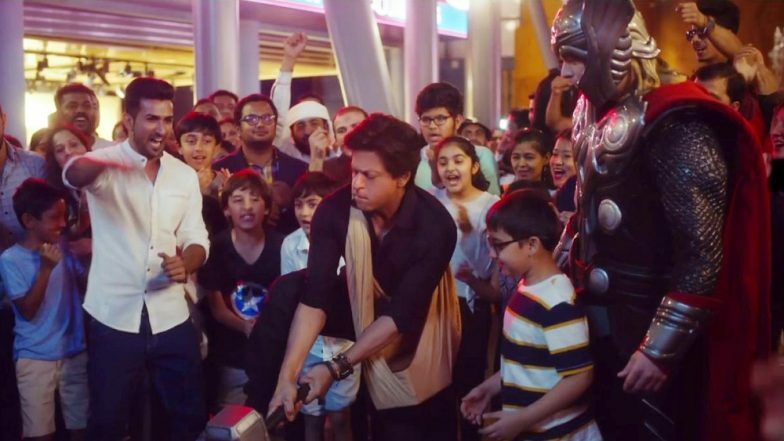 Dubai, March 22: Bollywood superstar Shah Rukh Khan joined hands with superheroes Captain America, Iron Man and Thor to solve yet another riddle in Dubai's picturesque locale in his latest promotional campaign. The 53-year-old superstar has been featuring in a series of videos that are part of Dubai Tourism's #BeMyGuest campaign. The fourth video starts with Shah Rukh saying out a riddle: "With hammer, shield and armour, Earth's mightiest heroes gain their power." The Dilwale star then goes to IMG World's Of Adventure, an indoor amusement park here and helps a woman find her lost son. He wins a prize that says "on all the walk to everything you need, the white hat is your guide". The engraved metal piece brings him the second coin. Shah Rukh Khan Is Back in Dubai To Uncover A Secret! Watch Videos. Now @iamsrk is on a spree to find all the coins! Win your quest with @emirates flights, 3 nights @SofitelDXBDownT & tickets to @IMGworlds for 2! Click below to watch Ep 4, retweet with where @iamsrk went before 24 Mar, 12am. "There are three hidden coins in Dubai.... Where do you think I should go for the last one?" SRK ends the video. The #BeMyGuest campaign consists of a series of films across social media and online platforms, highlighting iconic locations and sites in the posh Middle Eastern city.